Because we spend most of our time in our homes—not in garages—we often forget their importance. Do you make this same mistake? Garages can actually add more value to our lives than we think. And how you maintain the interior determines this. Are you ready to put a bit more thought into painting your garage floor? If you’re wondering why your garage floor always seems to be cracking and forming dust, it’s probably because it wasn’t prepared right before painting. So what about attempting a DIY project? 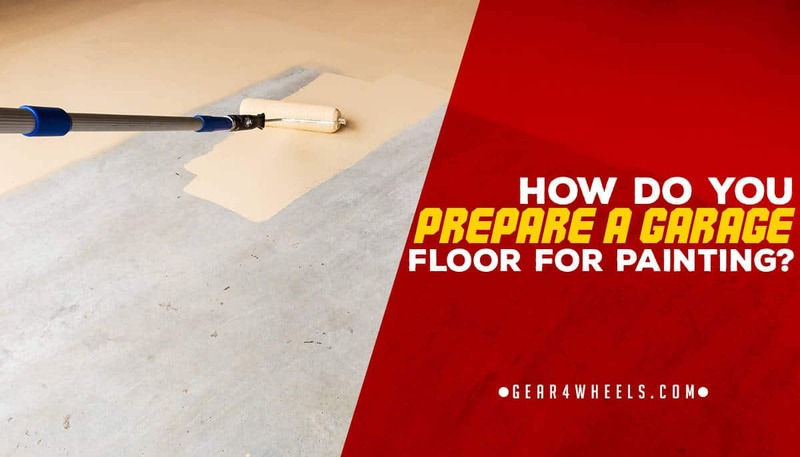 Below we tell you how to prepare a garage floor correctly for painting. Get this right and your garage will have a new luster, keep its look for a long time and you’ll even find more uses for it. Haven’t you been looking for space to work on your hobbies? A neat, well prepared and painted floor will make your garage more inviting. How do you prepare a garage floor for painting? You must think of everything that can go wrong. But we’ll help you. Use the information below as your checklist. Last thought—Do you need primer? You can’t simply start. Knowing the facts will help you get this right. If you’re using normal garage paint or stains, any dust residue will result in problems. Knowing what to look out for beforehand helps you prepare dynamically. We’re not joking. Rainy conditions prevent some paints from properly drying. You’ll take longer to finish. Even temperature plays a role because epoxy paints won’t set if the floor is too cold. It must at least be above 50°F. You don’t want to be caught off guard. Don’t assume the garage is in perfect condition. A small water leak can cause disaster a few weeks after you’ve painted. Here’s what you need to find out before you start. Is the cement really dry? This is especially important after building or renovations. 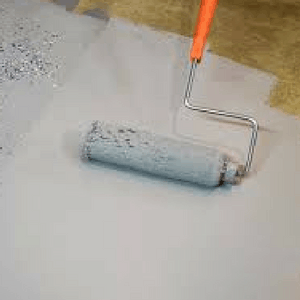 You must give the cement floor enough time to dry properly before you start painting it. You don’t want to seal in moisture. This will cause mold that will eventually be visible on the surface and can even damage your floor. If you’re recoating an old floor you must first remove old layers. This is especially relevant with resin coatings. New sealants and coatings won’t adhere as easily to painted products as to the cement itself. And you don’t want it to start coming off in the near future. But how do you know whether there’s an existing coat? Simply drop water onto the floor. If the water beads up, it’s proof there’s a sealer present. Remove it—usually through etching—before any painting is done. Even old floors can contain moisture. Once again our negligence of our garages mean that many builders don’t even lay down vapor barriers during construction. Luckily most problems can quickly be handled. All you need is a surface applied vapor barrier. But how do you know if it’s necessary? If you see any of these features you need to handle it before continuing your project. If you handled all these your project will most probably be a success. Here’s how you prepare for painting. Ready to start? Make sure you have all your tools at hand so you don’t waste time looking for them or making a trip to the hardware store. You may get tired of sweeping during this process. But as mentioned above, dust can be detrimental to your painting process. It’s smart to begin with a clean area because it allows you to see the necessary detail you have to attend to. What are these important details? Even your brand new car can leak a small amount of oil. Don’t assume your floor is free of this. Because untreated cement is porous, oil can seep in between the particles. Therefore a superficial glance over the floor isn’t enough. You’ll have to get down on your hands and knees and identify all the oily spots. You need to be quick during the last steps. You don’t want too much water seeping into the cement. After the oily mess is taken care of, you should wash the floor one more time. Don’t let any oily substances remain and settle into the cement again. Want to make the task easier? Here are some handy tools. We weren’t kidding when we said absolute cleanliness is necessary. You’ll think you’re decontaminating your home, but you’re simply preventing future mold and other problems. You can use citric acid concrete etch which you add to water. You can also use masonry cleaner. Leave it for a few minutes after application so it can do its work but don’t let the acid dry. Acid can damage your floor if left too long. Handy tip: Don’t risk splashing the acid in your face. Pour the acid into a sprayer for safe and easy application. 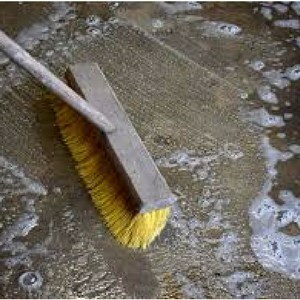 After maximum 20 minutes you can scrub the floor with the broom and then wash off the solution with water. Now you wait. The next steps will have disastrous outcomes if you work on wet floors. So sit back and rest a while. To speed up the drying process you can maximize airflow with fans or a heater. But remember heaters can let humidity rise if there isn’t enough ventilation. And this can once again kick start mold or counter your drying process. After all that cleaning you probably saw some imperfections in your floor. You can’t leave them. Cracks show through some coatings such as stains and even some epoxy products that are transparent. Don’t repeat the mistake of not handling your garage floor with respect. These cracks are bound to give off dust daily which can implicate your painting the following day. What’s your solution? Simply add filler to each imperfection and smooth it out with a knife or cardboard. And yes, now you have to wait for it to dry again. Afterwards you can sand it down for the ultimate smooth floor. I told you this will happen often. All your work resulted in some debris and dust lying around. And sanding off the filler makes fine dust you may not even notice. So do this whether you think it’s necessary or not. Handy tip: During this step, I prefer being extreme. I take out the vacuum cleaner. Instead of pushing the dust around—and perhaps into crevices—with a broom, I can extract all the necessary particles, so they don’t bother me when I start painting. Primer is not an afterthought. And you will probably have to wait until your primer is dry before you can start applying your garage floor paint or other coatings. Some preparations can take almost a day, depending on how dirty your floor is. Why not prime your floor after you’ve done your preparations? Remember some products such as epoxy require long curing periods. Plan ahead so you don’t run out of time in painting your floor. Daunted by this long to-do list? I’ll answer your question before you ask it. Yes, buit it is worth it. You’re saving yourself money and time because future renovations or maintenance will be minimal. There’s fewer chances of your floor deteriorating due to what’s going on underneath the paint. You just increased the life span of your floor!